Conserving energy and turning down the thermostat can leave one a might chilly in the evenings. This LapWrap gives light coverage on the lap and an extra pocket at the bottom to warm those “icicle toes”. The pocket creates a layer of warmth around the feet and ankles. 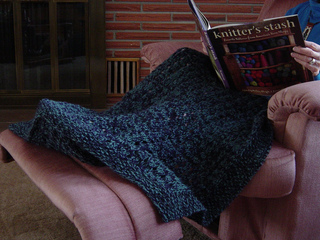 An easy knit for beginners, the pattern features stitches that are simple and easy to remember. Made with 2 strands of WoolPak held together. Pocket measures approx 17” wide x 15” deep. LapWrap can be fulled (not felted) to allow the yarn to blossom and soften. Fulling instructions included.